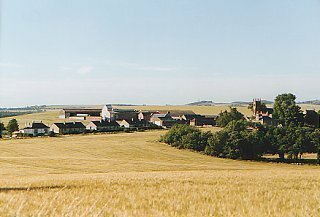 Lying to the west of the Gifford Water in East Lothian, 2½ miles (4 km) south of Haddington is the village of Bolton. It consists of a group of buildings on an elevated site, the most notable being the handsome Parish Church (1809), the former school (1838) and an 18th Century doo'cot. Bolton is best known as the last home of the poet Robert Burns's younger brother Gilbert, sister Annabella and mother Agnes Broun. Gilbert moved from Ayrshire on the death of his brother, working at Morham West Mains, 2½ miles (4 km) to the east, before becoming factor to Lord Blantyre at Lennoxlove. He took up residence in a house at Grant's Braes and his mother and sister came to live with him. The location of that house is marked by a road-side memorial some to a mile (1.5 km) north of the village and Burns' Mother's Well lies nearby. Gilbert oversaw the building of Bolton Parish Church and the family lie buried together in the churchyard. The parish is now united with nearby Saltoun. Lennoxlove House, now home of the Dukes of Hamilton, lies 2 miles (3 km) to the north.